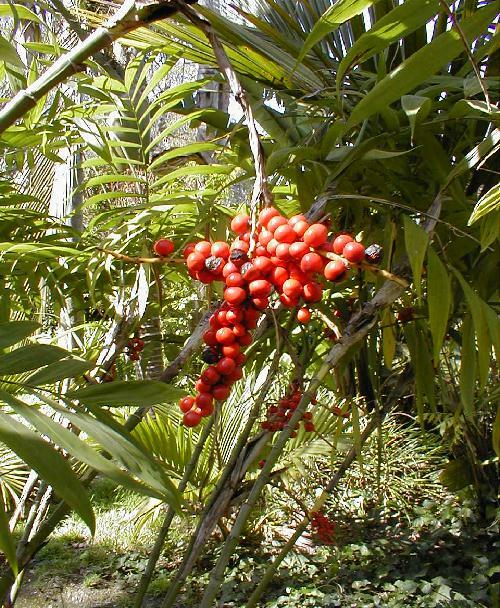 Chamaedorea microspadix is the top rated cold hardy Chamaedorea for most cold tolerance. Chamaedorea microspadix is one of the suckering clump forming bamboo palms which is native to the open forests of eastern and central Mexico. In the wild it forms dense colonies. 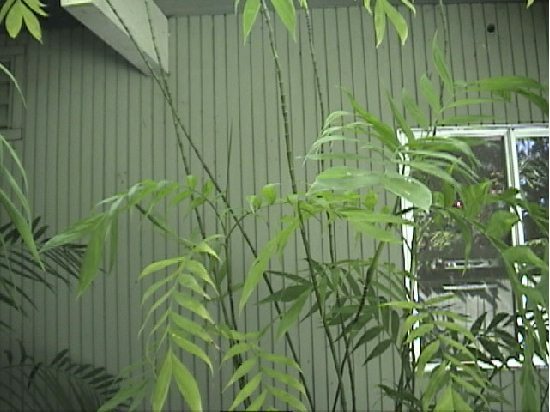 This plant is most distinguished by utilitarian ability to allow a temperate garden have the tropical appearance with its cold hardiness. Trunks are clustering with individuals up to 1/2 inch in diameter and ringed from leaf scars. Mature stocks range from 8 to 10 feet tall. Regular watering to keep this one moist will result in a lush spread as it is only moderately drought tolerant. The soil requirement is of no particular type, but should be well drained. The trunks have swollen leaf ring nodes and will sometimes have an adhered sheath that eventually falls. This can be planted in moderate to bright shade and some variations will actually accept direct sunlight in the cooler hours of the day with no damage. Each pinnate leaf is about 2 feet long and have 18 to 22 regularly arranged pinnate leaflets that are up to 8 inches long by 1 inch wide. There is a silver sheen to the pale green leaves and some variations actually have more sheen than others. Flower stalk emerges from among the leaves in 3 to 6 branches with fruit maturing to .4 inch diameter bright orange red berries. The inflorescence droops from among the leaves, will appear late in the summer but the emergence time may vary. The inflorescence will actually break through the sheaths on the stock. This is a dioecious plant which requires a male and female to set fertile seed. Male flowers are easily distinguished because they are in pairs. 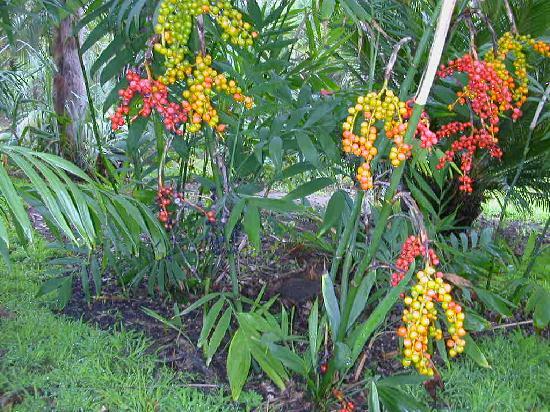 The abundant 0.4 inch diameter fruit is bright, attractive, orange-red in color and really beautifies the garden. Propagation by clump separation or from fresh seeds will take up to 2 months to germinate. Caution is advised when handling the seeds since the fruit contains oxalic acid which is a skin irritant. 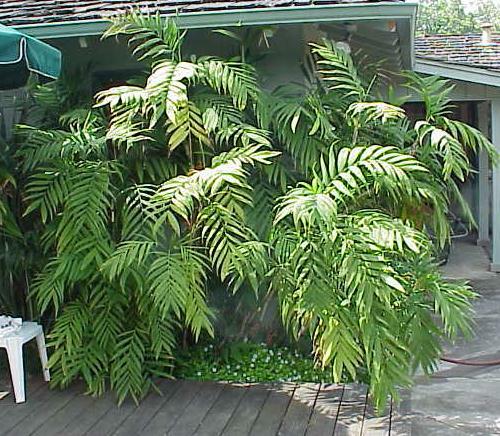 This Chamaedorea is also suitable for use as a house plant or potted patio specimen. C microspadix in Walnut creek have survived temperatures down to 22� F with no damage. Some canes, but not many were killed inthe big freeze when temps. dropped to 14� F.